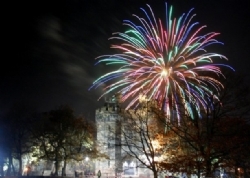 Lancaster Castle will once again play a pivotal role in the city’s annual celebration of light next weekend. For the fifth consecutive year Light Up Lancaster will transform landmark buildings at locations across the city, starting with Lancaster Castle and Castle Hill. Light Up Lancaster is a partnership event between Lancaster City Council and Lancaster Arts Partnership (LAP). Supported by Arts Council England, Lancaster Business Improvement District (BID), University of Cumbria, the Duchy of Lancaster and other arts organisations across the city, it forms part of a network of similar events across the North, including festivals in Leeds, Durham, Newcastle/ Gateshead, York, Blackpool and Salford. Each year, the Castle showcases a brand new multimedia art and light installation and provides the focal point for a specially commissioned firework display which can be seen right across the city. Two new companies have imagineered the 2017 digital mapping and fireworks show Lancashire-based Imitating the Dog and Midlands-based Sirotechnics Fireworks. This year’s offering from award-winning Lancashire company, imitating the dog, is a piece entitled Trespass. Billed as ‘part video game, part ‘Where The While Things Are’, it tells the tale of a child who goes looking for more after the world has gone to bed. Written in collaboration with musician and composer James Hamilton, the piece will also feature performances from a community choir. Sirotechnics won the 2017 Champion of Champions award at the British Musical Fireworks Championship in Southport earlier this year. This is the first time they have brought one of their highly acclaimed shows to Lancaster Castle. Visitors can expect stunning visual displays combined with dramatic and atmospheric music to produce a stunning finale for visitors and residents alike. Some 5,000 visitors are expected to visit the Castle over the festival weekend, while three main viewing sites across the city will mean that the fireworks can be viewed by up to 22,000 people. Entry to the event is free of charge and doors open at 5.30 pm on both Friday 3rd and Saturday 4th November. The Castle gates will close at 10.00 pm on the Friday and slightly earlier (7.00 pm) on the Saturday to allow for the final set-up of the firework displays.